I'm sorry, what were you asking me? Oh, yes, that stupid plastic container I asked you to buy. You see, hydrofluoric acid won't eat through plastic; it will however dissolve metal, rock, glass, ceramic. So there's that. 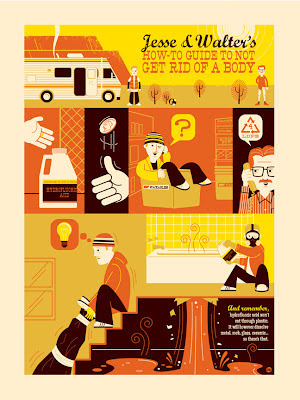 As we approach the new season of "Breaking Bad," to celebrate and honor a show truly kept alive by its fan community, 16 of the top artists and graphic designers have been commissioned to create screenprints depicting some of the series' most memorable scenes, characters and shocking moments. These screenprints are hand-pulled, each its own individual work of art, in an edition of just 300, with only 200 available to the public through this project. Once the edition is sold out, they will never be printed again. To be honest, I had never seen the show before I was asked to participate in the project but I had always heard good things. Since my piece was based off of something that happens in first season second episode I could've just stopped watching then, but I got addicted and ended up watching the whole series in three weeks. If you haven't seen this show, you really should. It is in my opinion one of the best shows on television today. It is so well acted and filmed I feel like i'm watching a movie. The final season starts July 15th and like a meth-head I am totally jonesing for it. I'll be sitting in front of the TV that night sippin' some Schraderbrau and eating some chicken from Los Pollo Hermanos.